We have been debating on and off about getting chicks this year. There are so many reasons to do and just as many reasons to sit out a year. We are approaching the end of chick days, so if we don’t buy some soon, then the decision will soon be out of our hands. A sign of the times…Chick Days. One of the reasons we need to consider new birds is predators. Last year we lost a number of hens to a fox. We have not lost to predators every year, but it is always a possibility. We could not take that same kind of predation again this year. We have already seen a large fox this year. Our hens already are not doing as much free ranging as they would like because of this. We are keeping them in the run more hours and close to the house when they are free ranging. It is not a guarantee that they will not meet an unfortunate demise, but it does decrease the odds of them being fox dinner. Another reason for thinking about adding some youngsters to our flock is some of our hens are past peak laying and if we don’t retire them to freezer camp this year, they will only be good for stock. I hate to be wasteful. It seems to me that is almost disrespectful to not fully utilize the bird. When they get beyond tough it settles wrong with me, it seems that I have been less than a good steward. You want to rotate out your heavy laying hens every 18-24 months if you hope to eat them. One of the reasons to not get chicks is we would get to put off one of the worst parts of backyard chicken wrangling, butchering. I would so love to put them in a cage haul them off to be butchered and come back neat little hens in a plastic bag, but it doesn’t work that way. It one of those things that is a reminder to me of the hard work that goes into putting food on our table. Another reason to not get chicks is I just plain old don’t like the part of raising baby chicks. They are sensitive to cold, drafts and require lots of work to get them to the laying age. Some people love this part, to me it is just one big hassle, I’d rather skip. There is a period where we are running two separate flocks and two separate sets of chores for each of them. The local ranch supply will be getting birds in only for a couple more weeks, so we will soon be making the road trip to get some chicks or by procrastination the decision will be made for us. Either way is ok with us this year. One of This and Two of That – Chicks! Every year at this time there is a phenomenon going on called chick days. It is when local tractor/ranch supply stores bring in baby chicks for sale. Most of the ranch supply stores bring in an assortment of breeds which proves to be a great challenge for me. I am one of those folks who wants my chickens to be cute, no standard white, red or black for me. I find myself buying more than I should and it is not because baby chicks are cute. No I imagine what the feathers on all the breeds will look like and get caught up in the possibilities down the road. This year I ended up with ten chicks. I was planning on six….tops eight. I ended up with gold lace wyandotte, silver lace wyandotte, light Brahma, buff Orpington and barred rocks this year. Time will tell how they all fare and how I fare with my choices this year. This week a colleague shared here joy in stopping by the local post office and hearing boxes of baby chicks peeping away. She shared how much hope it gave her that indeed spring was coming. It made me wish they were on their way to me. Instead I will be picking this year’s chicks up at the local ranch supply. Chick days are just starting in Montana. For those of unfamiliar with Chick Days, it is when baby chicks are shipped in mass to farm and ranch supply stores for purchase by the locals that don’t order their own from hatcheries. The weather here is just beginning to be warm enough for the little critters to make their way to the great white North. Planning for the baby chicks is definitely a process that has to take place before you bring home your little ones. You need to make sure that your equipment is all in good working order to keep those babies draft free and warm. Here is my check list. It is good for seasoned chicken wranglers and first time chick raising alike. Food and Water I need to pull down all the little-size feeders and water fountains for the bundles of fluff. The little critters can actually drown in adult sized equipment. So you need chick sized equipment that they will outgrown in a month or so. Be prepared if you are new to the chick raising you will need both sizes. Heat I always have two heat lamps, but they need to be plugged in and the bulbs need to be tested. I always keep a spare bulb in the box on the shelf in the chicken coop. The first week your chicks need to have an ambient room temperature of 90-95 degrees. You lower it approximately 5 degrees a week. I have never seen a big jump in my electric bill from baby chicks, but until they are feathered they really can not keep warm, the light does it all. Housing/Brooder Your brooder needs to be set up before you bring your peeps home. It should be a warm draft-free environment. I use a dog crate those first few weeks, with cardboard zip stripped onto the sides to prevent drafts I cover the bottom with paper towels the first few days and then move over to shavings. People have everything from fancy special made brooders to a washtub in the basement with heat lamps on the top. Growth As your chicks grow you will need to expand the size of their living quarters. Each of us does it in our own way. My chicks move from the house to a shelter separate corner of the coop no later than the third or fourth week. It requires all sorts of modifications to the coop to get the heat lamps set up, protection from the big girls, ensuring they are draft free and more. It sounds worse than it is because after years of doing this I know how to make it happen. Some of the hooks that are set up to support this each spring are already there waiting for this year’s flock. First and foremost is planning is the key to success in. Chick are not and should not be an impulse “oh so cute” purchase. If this is your first time there is a host of purchases that needs to be done before you get your chicks. If you are like me and a seasoned chicken wrangler then this process is another of the rights of passage into spring you do each year. I swap out chickens every year from my backyard flock. Some of the older birds or ones that are not performing as well as I hoped go to the freezer. They are replaced by new chicks. Getting the perfect mix of chicks for my flock requires me to order from hatcheries online. I have some personal favorite breeds that are almost impossible to find at the local ranch store. I usually try to order the week after my employer’s conference in January. This year I sustained an injury and have had troubles with keyboarding, so did not get online and make put together my order. I just checked online at my favorite hatchery that allows me to pick my order one chick at a time, though I usually go with two or three, and stocks all my hard to find favorites. I am too late. I wanted my chicks to be shipped for a March arrival. My choices were sold out until June and July. I am too late. On to Plan B. It means I will settle for favorites that I find this year at the ranch supply. I will be watching for the announcement of Chick Days. You can bet I will be at the first or second one they have. I have already lost out once, I am not going to do it again. You snooze — you loose. Most of the folks were patient and very helpful with what I am sure was their 100th plus call with the same questions; What are you getting and what day are they coming? I did not need them to run through the list of everything coming in, I just wanted to know what heavy dual purpose birds they were getting and the planned arrival dates. Most of them knew then exactly what I was looking for and the call was short and sweet. One location, the chicken man talked about a couple breeds saying how well they dressed out for him last year. One location asked me what a dual purpose bird was, it made me smile wondering if she thought it meant they dueled like chicken fighting. He should have spent a little time reading up if he was going to be in charge of birds for the store. Lord knows what advise he will give to beginners. All the time I spent finding phone numbers of farm stores on the internet, and then placing phone calls, drove home to me that the farm supply stores don’t really get the value of leveraging the net. I know that ordering chickens is a little unpredictable, but I honestly don’t know why farm stores don’t post a list for the store of the planned delivery/order schedule of chicks. They can add a disclaimer at the bottom that the actual in store chicks are subject to change due to hatchery availability and shipping schedules. It would save tons of their employee’s time. They make changes to their website to announce chick days, so adding the schedule would be no big deal for their website manager. My decision is that my chicks will becoming from either Bozeman or Helena. I will be at the store early to get chicks, and will make the best with what they have that week. I won’t have the prettiest group of hens that my neighbors and friends have come to expect. But as always they will lay well and tolerate Montana winters just fine. In the end I will have some nice egg layers and a few birds in the freezer. Chick days have started in Montana and this is one of the first signs of spring. Chick days are when the local farm supplies get baby chicks. Folks who just want a few chickens or a mixed flock this is the time that they can make it happen locally. For those of you unfamiliar with baby chicks, if you don’t hatch your own, or know some one who does, your chicks come from hatcheries. It used to be that there were many smaller hatcheries all around the country, but those have long since disappeared. As this happened the remaining hatcheries had to be come creative, which gave us chicks via the US Mail. (Bees come the same way!) 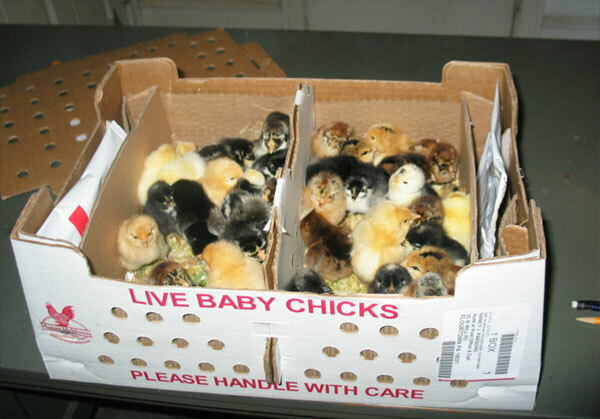 Boxes are designed to hold 25 day-old chicks for the trip. This special box outfit is such that the chicks are not bounced around too much, but kept warm enough, and have access to fresh air. If you wonder how they make this trip without food and water, chicks gorge themselves on the last of the food before they hatch and they can go two days without food and water. When they arrive you dip their beek into the water tray, to signal to them it is time to start your life in the real world. It is not a perfect system, but since we have so few hatcheries left it is the only option available to many of us. Farm stores set up six to ten stock tanks with heat lamps in anticipation of chicks arrival. Each week the store will get multiple shipments of chicks having some of the most popular breeds and a few of the rarer breeds. They arrive on a given day and the chicken folks flock to the store waiting for it to open so we can have the broadest selection. I have done this a time or two and I can tell you that you need to be there when they arrive, period. No excuses. If it means you drive 100 or so miles one way, set your alarm clock early. Those who snooze, will loose. I don’t mean that your selection will be crummy, I mean the chicks will be gone. 10 o’clock is getting late, by noon the chicks are nada. This week I will be calling five farm stores to see what type of chicks they will be getting and the planned schedule. I will then figure out which store and week is my first choice and which is my second. Then I will be planning a vacation day and road trip to get this year’s chicks. In Montana nice weather is months away, tulips and daffodils are still weeks away, but the first sign of spring baby chicks is here. I am getting spring fever.